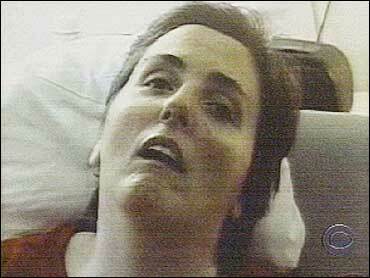 A judge gave Terri Schiavo's husband permission to remove the brain-damaged woman's feeding tube in three weeks, handing him a victory in his effort to carry out what he says were his wife's wishes not to be kept alive artificially. The ruling by Pinellas Circuit Court Judge George Greer will allow the husband, Michael Schiavo, to order the tube removed at 1 p.m. on March 18. In the meantime, the woman's parents, who want her kept alive, are expected to ask another court to block the order from taking effect. The judge wrote that he was no longer comfortable granting delays in the long-running family feud, which has been going on for nearly seven years and has been waged in every level of Florida's court system. He said the case must end. "The court is no longer comfortable granting stays simply upon the filings of new motions," Greer wrote. "There will always be 'new' issues." The tube keeps the 41-year-old disabled woman alive. The husband, Michael Schiavo, says he is seeking to carry out his wife's wishes not to be kept alive artificially. The decision came on the 15th anniversary of Terri Schiavo's collapse, when a chemical imbalance brought on by an eating disorder caused her heart to stop beating. Schiavo left no written instructions before a heart attack left her severely brain-damaged at age 26, leading to four different trials and a Florida law that was overturned in court, reports Gordon Byrd of CBS radio affiliate WHNZ. The parents were at the Pinellas Park hospice where Terri Schiavo is being cared for when Greer's order was issued. They were planning an afternoon news conference. Greer previously granted Terri Schiavo's parents, Bob and Mary Schindler, a stay until 5 p.m. Friday. The judge made his decision after pleadings from the parents that they need more time to pursue additional medical tests which might prove their daughter has more mental capabilities than previously thought. State officials also are trying to intervene in the case. Attorneys for the Schindlers said the state wants a 60-day stay to investigate allegations that she is being mistreated by being denied appropriate medical care and rehabilitation. The Schindlers and their son-in-law have fought each other in court since the late 1990s on whether Terri Schiavo should live or die. The two sides have battled through scores of opinions and rulings and tens of thousands of pages of filings. The feud has taken on elements of a soap opera, with allegations that it began as a fight over more than $1 million awarded to Terri Schiavo in a medical malpractice case which her husband stood to inherit. Michael Schiavo has also been accused by his in-laws of having a conflict of interest in wanting his wife dead because he has started a new family with another woman. The Schindlers do not believe their daughter is in a persistent vegetative state as court-appointed doctors have ruled. A leading Vatican cardinal also has weighed in on behalf of keeping Terri Schiavo alive. "If Mr. Schiavo legally succeeded in provoking the death of his wife, this would not only be tragic in itself, but it would be a serious step toward legally approving euthanasia in the United States," Cardinal Renato Martino, the head of the Pontifical Council for Justice and Peace, told Vatican Radio on Thursday. In an unofficial poll on CBSNews.com, readers following the story have voted 63 percent to 37 percent that Schiavo should be allowed to die.